Let's see a quick tip for aligning vertically navigation lists that use the tipical floated box approach to display the list in a row, but that have several items displayed across multiples lines. 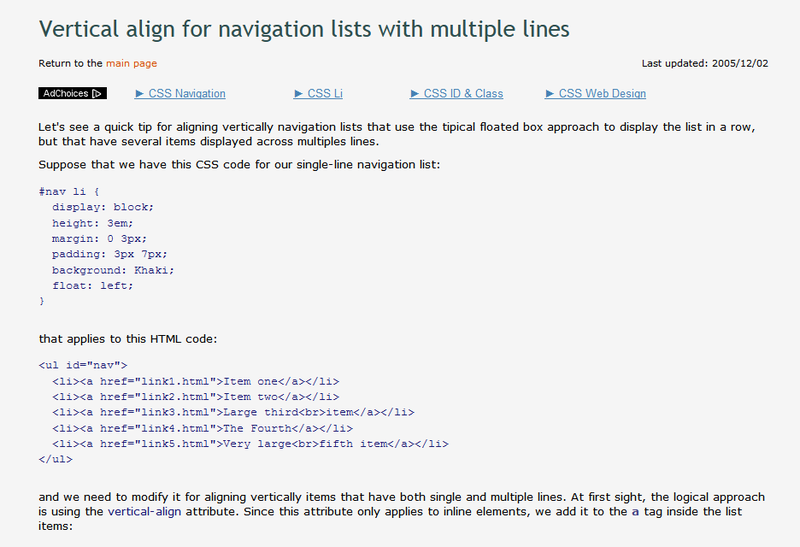 Vertical align for navigation lists with multiple lines. If you ever made a web site with the content in a center column and a different background for the body, or with a navigation bar not too tall, probably you experienced the problem of some elements not extending to the bottom of the browser window when the content height is lesser that the content area of the browser window. Making web pages extend to the bottom of the browser window. While in the process of redesign one of my sites I stumbled upon some inconsistences in the margin applied to the floated boxes that I have in one of my pages. At first I thought that it was due another IE float bug (and it's in part true), but some tests proved that all browsers have issues when applying the margin. A fix for float-margin inconsistences across browsers. When you are making a web page, the easiest way of view a page stored in your hard disk is double-clicking in the file, which usually results in the page being opened in your default browser. Although this method (which I still use sometimes) it's good enough for simple static pages, it's not useful if you you are using server side languages, or even with pages that are static but use links relative to the server root. In this situations the a good solution can be set up a local test server for making all the design and tests in the same computer. How to install Apache (and PHP+MySQL) on Windows. Depending of the program you use for saving JPEG images, there are available some options for adjust the compression of the image. In this article I'll try to explain how to adjust that options and optimize the ratio between image quality and file size. Optimization of JPEG compression settings. No Comment to " Free Web Design Tips & Tricks - Graphic Design Forum and Web Design Forum "